• Los Angeles is 115 miles to the south, and San Francisco is 265 miles to the north. Detail map, note: the BNSF rail line below. Map of the general area showing major highways / interstate. Interstate 5 and Highway 99. 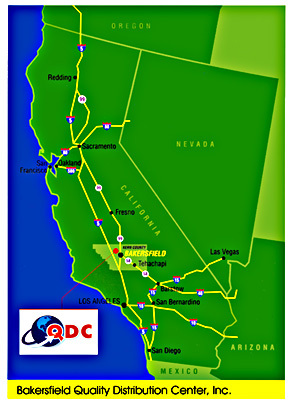 Contiguous to the BNSF main rail line; and close proximity to Bakersfield's Meadows Field Airport (BFL) for special cargos of air travel-transport when needed. Click on Map to View Larger detail. 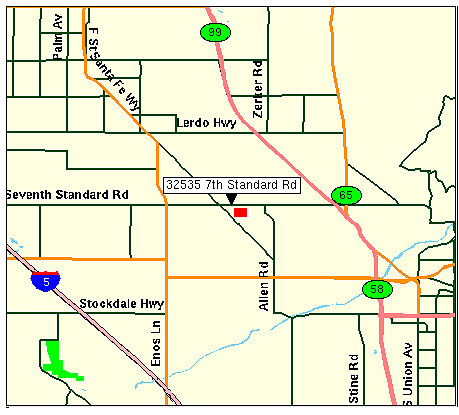 Division Maps on BNSF web site are in .gif and .PDF formats. To view the PDF format maps you need Adobe Acrobat Reader.